Vacation Apartment with Pool, Air Conditioning, Wifi, Garden and Panoramic Views. Each apartment is about 24 m2 plus a loft and has a living room with sofa, chairs and table, a small kitchen with ceramic hob, fridge and kettle. Otherwise, equipment for easy cooking. A staircase up on the loft is a double bed. There is a sofa bed down for an additional person, possibly two children. 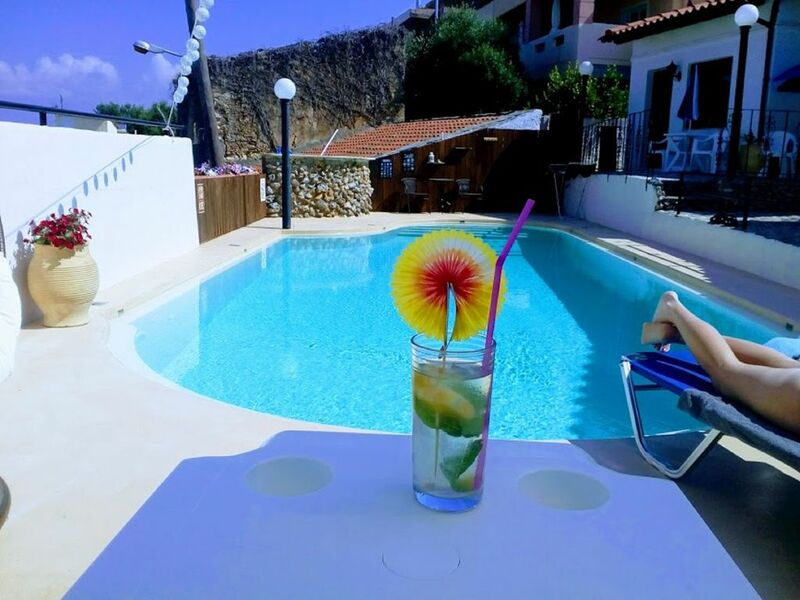 Those who find their way to us are primarily adults who want to use the place as a starting point for trips around beautiful Crete and spend quiet evenings at the outdoor grill and the pool. that there is only enough hand luggage on the holiday trip. Great holiday the owner thought of every little detail to make our stay better. Harry (the caretaker) was very nice and helpful. The villa is at the top of a very steep hill so a car is recommended but not absolutely necessary as the bus stop is only 10 min walk away. Lovely pool area and views are grand. Have already booked for next year so you can see it's so good. Thank you very much Philip and welcome back next year !